Every year we get very excited about Christmas, pretty much from January onwards. But when the month of December comes along, we are beside ourselves with excitement, especially when we start to open our advent calendars. So for the podcast, it seems really sensible to include a section where we literally Countdown to Christmas, sharing fun, festive 'feel good' stories and lots more besides. Don't forget you can email us if you have any seasonal stories to share. Did you manage to get hold of a Dan and Phil advent calendar? They were selling like hot cakes. We've got festive movie reviews, classic jokes, mince pie tasting, scary Christmas stories and some great songs, including our very own 'Snowball Song'. So tune in, sit back, get your mince pies ready and switch on those fairy lights. Festive Stories for 19 December 2015 - Stories include frozen Christmas dinners, a scrimping mum with a tree made from egg boxes, the Coca Cola ribbon bow, record-breaking warm winter weather and upside-down trees hanging from the ceiling. Festive Stories for 12 December 2015 - Stories include a very Merry Vlogmas from Zoella, Nala, Pippin and Percy, as well as the best festive knits this year, over indulgence and the Archbishop's proposed 'phone fast'. Festive Stories for 5 December 2015 - Stories include charity beginning at home, the 50 year anniversary of the 'Xmas Meteorite', seasonal advertisements going viral on YouTube and Santa Claus in California..
Festive Stories for 28 November 2015 - Stories include Santa Claus visiting Kwik-Fit to get his sleigh repaired, a blind tasting of mince pies (Harrods vs Lidls), fairy lights that look like pairs of pants, and how your name can determine whether you will be appearing on the 'Nice List' or the 'Naughty List' this year. Funny Christmas Jokes - If you are in a festive mood and looking for a laugh, then check out these funny jokes and see if they make you smile, giggle or chotle uncontrollably. The Best Mince Pies, and the Worst - We have tasted and tasted loads of mince pies, boxes and boxes, so that we can tell you which ones to buy, and more importantly, which ones to avoid. Our Funny Christmas Song - This was so much fun to write and perform, in front of a green screen with lots of festive pictures behind us and silly props. The song was inspired by our 'friend of the show' Dr. Jean, of Banana Dance song fame. Thumbs up if you like it please! 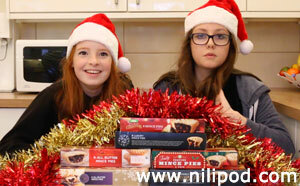 Tasting and Reviewing Supermarket Mince Pies - Which Ones Are The Best? 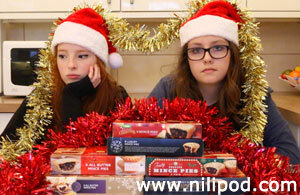 We tasted a whole load of supermarket mince pies, some were really good and some were just awful. The winner was one of the cheapest, so that was a nice surprise. We went Christmas Shopping in Doddies and Nia managed to keep knocking over the Santa Claus toys. The Yee dinosaur is a classic YouTube video, that's for sure, but is it right to turn it into a Christmas video? You decide whether it is weird or wonderful! We thought it would be fun if we opened our presents together on Christmas Day, in front on the camera.